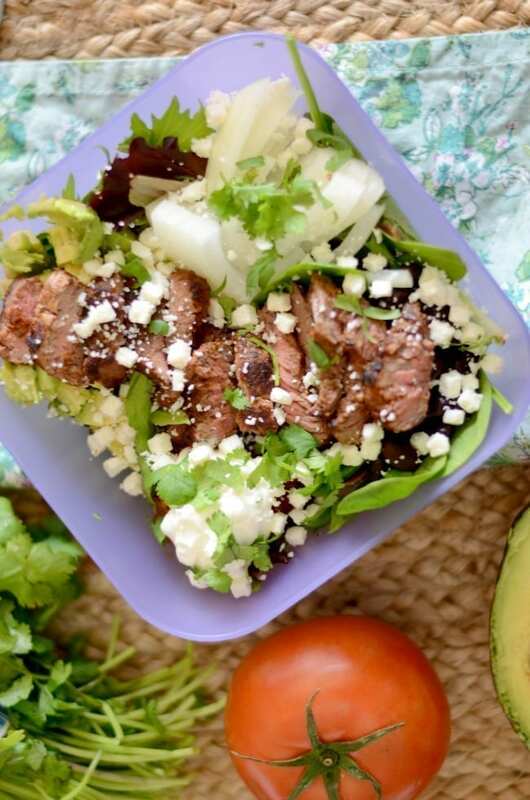 This grilled steak taco salad is the perfect healthy dinner or lunch. Hey yall! Oh man, summer is coming to an end – and fast! It seems like the kids just got out of school and now we are back to school shopping. They have been out of school for almost two months and we spent one whole month in Michigan with family. We played, picked blueberries, swam, went to the zoo, had three birthday parties, tractor rides, tended to the garden and had bunches of sleepovers with cousins. Whew. That’s a lot for just one month. No wonder the summer went so fast. One of the other things that we have done all summer long is use our grill to cook quick and easy dinners. We are able to grill most of the year here in South Texas but we really go at it during the summer. Why? Momma doesn’t want to turn on her oven if momma doesn’t have to. I need to keep the house cool and grilling outside helps with that a ton. What do we grill? Well, everything. Chicken, burgers, hot dogs, shrimp, fish, pork. If it can be cooked on the grill somehow, then on the grill it goes. But my favorite thing to grill? Steak! I love a super juicy and perfectly tender grilled steak. And that’s just a few of the steak cuts! You can check out more types of steak here. Now that you’ve picked your favorite type of steak, let’s talk about the seasonings. Some people go traditional when it comes to grilled steak. Salt and pepper. That’s it. I tend to lean to the traditional side more often then not but I like to add a little spice to my steak every once and awhile too. 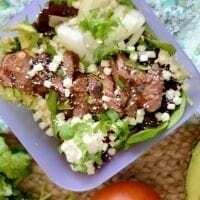 For this grilled steak taco salad I used our homemade taco seasoning to give it a little extra kick. 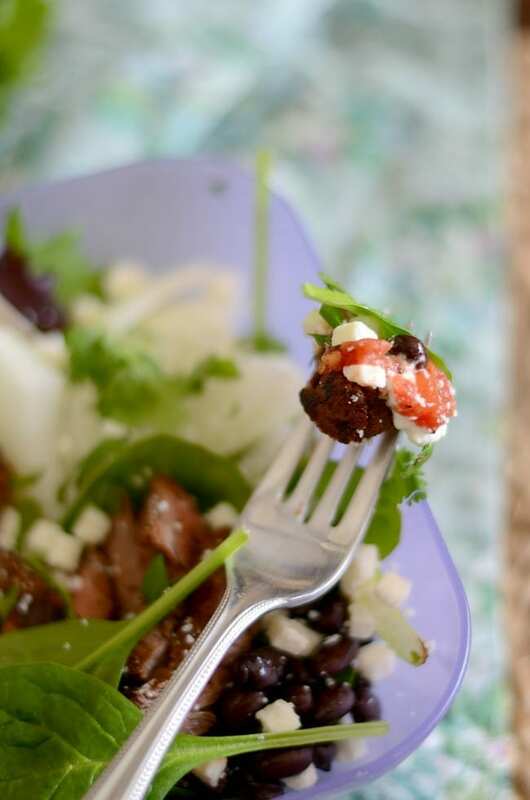 The other great thing about this steak salad is that it is an iron rich meal. 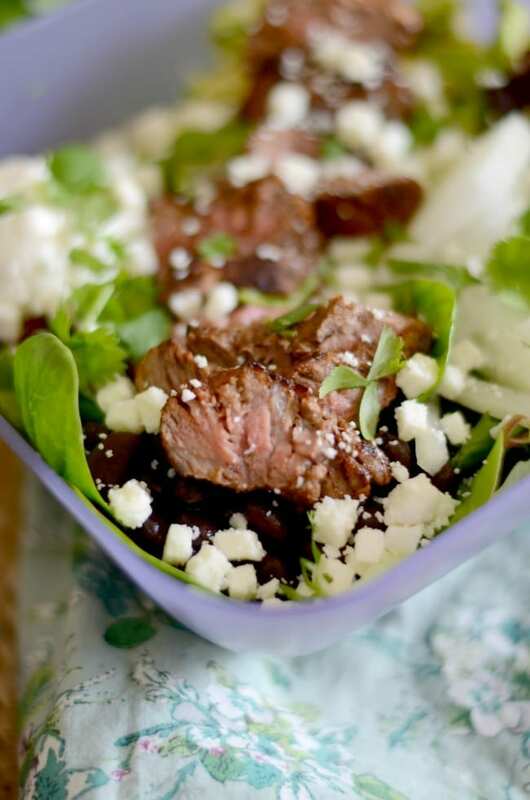 From the steak to the spinach to the black beans, there is tons of iron in this one salad. 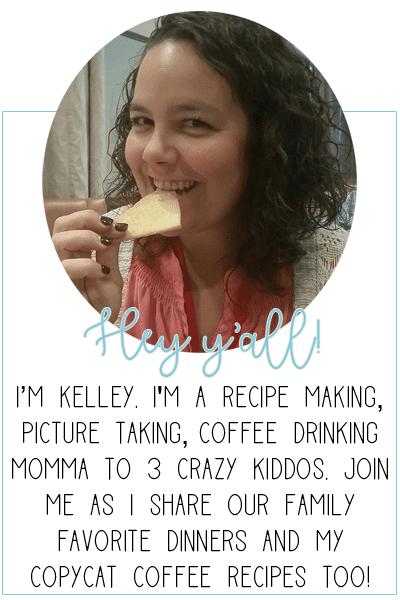 (Which is why it also makes a great lactation recipe for moms!) I am anemic so the more iron I can get in, the better! Oh, and it’s gluten free too. Perfect for anyone who is avoiding gluten or has a sensitivity. Pick your favorite cut of steak. Any type of steak works great for this recipe! Season it however you like. I used taco seasoning for mine but if you want to go with just salt and pepper -feel free! Although this is a grilled steak recipe, you can also cook the steak on the stove. Start with a hot skillet and cook for 4-5 minutes on each side or until it has reached your desired doneness. Allow the steak to rest for 5 minutes before cutting it. Start your grill and get it nice and hot. Season each side of your steak with taco seasoning. Place your steak on and allow to cook 4-5 minutes on each side, or until desired doneness on the inside. Remove steak from grill and allow to rest for 10 minutes before slicing. While you are waiting on the steak, assemble the salad. Add the spinach, black beans, onion, tomatoes and avocado. 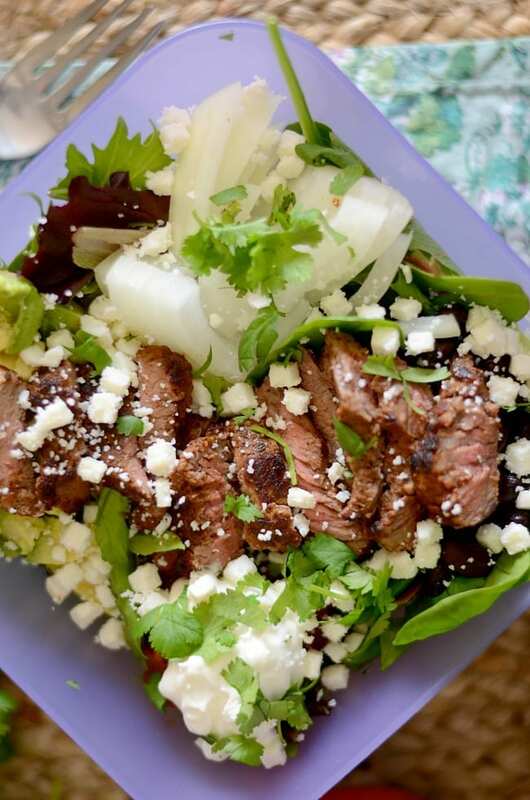 Add the sliced steak and top with cilantro and queso fresco. This recipe makes one salad. To cook on the stove top - Start with a hot skillet and cook for 4-5 minutes on each side or until it has reached your desired doneness. Whole30 taco boats – made with ground beef and perfect for anyone doing Whole30! Baked chicken tacos – another quick and easy taco idea but with chicken! Mango shrimp tacos – these are a family favorite for Taco Tuesday! Taco pasta salad – tacos and pasta combined to make one amazing dish. Hope you enjoy Jane! It’s one of my favorites for sure.